I’ve been making it for my family for years. It’s a cheap easy meal and very filling. You can make this meat loaf recipe with minced beef, pork, turkey or chicken. I use breadcrumbs to hold the loaf together and the stuffing. You can use white bread too, but whole meal is healthier. Try to use bread which is more than a day old as it makes much finer crumbs. Most of the time I use lean beef for this healthy meatloaf recipe. I have also made it with minced chicken, turkey and pork. They are drier meats than beef. Its much quicker to use a blender to make fine breadcrumbs, chop onions and herbs. I've tried to mix the meat into the rest of the ingredients in the blender but the poor machine can't cope. The mixture gets to stiff for the blender to move. So be warned, you could break the your lovely blender. Just use the blender for chopping the veg and herbs. About making the healthy meatloaf recipe. Make the meat mixture for the recipe first. Then leave to one side to let the flaviours combine while you make the stuffing. Place the breadcrumbs, chopped onion, crushed garlic and chopped parsley, coriander andsalt into a large bowl. Now add all the minced beef to the bowl. Using your nice clean hands, combine all the meat, onions herbs and breadcrumbs together until they are really evenly mixed. Place the breadcrumbs into a separate bowl. Remove the sink from the pork sausages . Add to the breadcrumb mixture. With clean hands, combine all the stuffing ingredients until well mixed. We want to make a sandwich using half meat mixture, stuffing in the middle, topped off with the rest of the meat mixture. Press the meat mixture flat in the bowl. With the edge of your hand cut the meat mixture in the middle, like using a knife. This will give 2 even pieces. 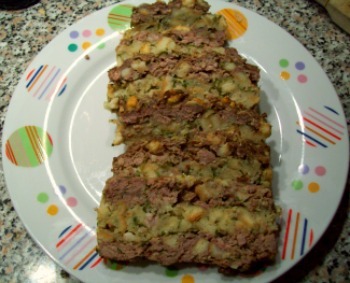 Using a loaf tin, place half the meat mixture in the bottom. Spread and lightly press it down and across the bottom of the loaf tin. Now place all the stuffing in the loaf tin. Top off with the other half of the meat mixture. Spread and press down. Make sure the stuffing is completely covered with the meat. Using the side of your hand again, press down along the 4 sides of the loaf tin to make a small channel for any fat to run into. This way any fat that suffices will sit around the edge of the meatloaf and can be drained off easily. Cover the loaf tin with foil, folding it tightly over the 4 sides. Place on the middle shelf of your preheated oven. Bake for approximately 45 minutes, remove the foil and cook until the top turns mid brown. The middle of the meatloaf should be firm, if it’s a bit soft and moist put it back in the oven for a few more minutes. When the healthy meat loaf is ready, place on a wooden board cover with foil and let it rest for 5-10 minutes before removing and slicing. You can serve this healthy meatloaf recipe with so many side dishes. Sometime we have leftovers in a sandwich, its really filling and very tasty the next day. Some side dishes I serve with meat loaf. Leftover meat loaf slices in a sandwich. When the loaf has cold down, wrap in foil and keep in the fridge. eat within 2 days of cooking. Can you freeze this healthy meatloaf? Yes you can. The best way is to wrap it tightly in cling film first. Then put it in a plastic container with a tight fitting lid. This should stop the meat loaf getting freezer burned. I hope you like my mums healthy meatloaf recipe as much as my family do. If you do, recommend it to your friends, click the Like button on this page to share it.